The Quatrac 3 is Vredestein's ultimate four-season tire. The tire is the perfect alternative for motorists who want to drive all year round in a moderate climate on one type of tire. The striking asymmetrical, non-directional tread with the separate summer and winter sides offers optimal safety and comfort in all weather conditions. The tire has excellent handling characteristics that are ideal for driving in summer conditions on dry and wet roads. 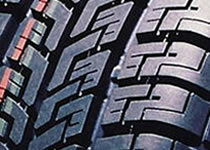 At the same time, the tire also offers perfect grip and high discharging capacity in winter conditions. The tread contains three longitudinal grooves which not only serve an aesthetic function, but also discharge water efficiently. The summer side of the Quatrac 3 is located in the outermost part of the tread. The summer side of the Quatrac 3 has a lower air ratio (more rubber, less air) and a small number of straight sipes. In summer conditions this produces extra grip on the outer shoulder, on both dry and wet surfaces. Because of the extra quantity of rubber on the outer shoulder and the rigid tread blocks, the tyre responds alertly to steering reactions. The inner section of the Quatrac 3 has a very open tread structure with undulating sipes, which provide extra traction on snowy surfaces in winter conditions. This part of the tread also has a high discharge capacity, preventing mud and snow from getting stuck in the tread and ensuring that the grip remains optimal.The Quatrac 3 bears the Snowflake and M&S symbols and hence complies with the requirements for a winter tyre. The new Vredestein Quatrac 5 is characterised by the sleek, asymmetrical design of the tread. The new Vredestein Quatrac 5 is characterised by the sleek, asymmetrical design of the tread. The summer side, with reduced air ratio, ensures excellent handling and great steering precision on dry and wet road surfaces, while the winter side, with advanced sipe technology, guarantees good grip on cold or snowy surfaces. 3D Grip Claws arranged between the sipes in the middle of the tyre ensure perfect grip in bends and make it possible to accelerate quickly, even on snowy and icy roads. The innovative Full Silica tread compound mix ensures an even wear pattern and a long life span. Thanks to its low rolling resistance, short braking distance on wet surfaces and low rolling noise, the Vredestein Quatrac 5 also scores well on all three aspects of the EU tyre label.